1. Add 1 cup (225ml) boiling water to contents of packet. Stir until dissolved. 2. Add 1 cup of cold water and stir. Stir thoroughly. Pour in mould and set in fridge. For quick setting: Use 6 pieces of ice cubes (38ml per piece) instead of one cup of cold water in Step 2 and stir until melted. Caution: Jelly powder contains gelatine (consists of protein). However, some kinds of fruits such as pineapple, kiwifruit, papaya contain enzyme which might break down the protein of gelatine and effect jelly setting. Heat the fresh fruit before adding it into the jelly mixture or use canned fruit instead is recommended. 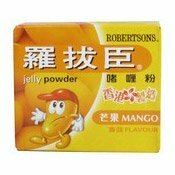 Simply enter your details below and we will send you an e-mail when “Fruit Jelly Powder (Mango) (羅拔臣啫哩粉)” is back in stock!